Requiem for fossil fuels is the culmination of twenty years of work by Bruce Odland and Sam Auinger, listening to and intervening in the urban soundscapes of cities around the world. In 2004, Odland and Auinger presented an early version of their Requiem for fossil fuels at the SophienKirche in Berlin as part of Inventionen Festival. 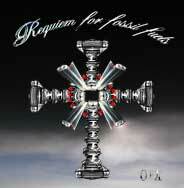 Materials for Requiem for fossil fuels come from O+A’s “alphabet of sounds”. This collection of recordings is the result of an ongoing search for a “Hearing Perspective” of the sounds we make as a culture. Each section of Requiem for fossil fuels uses a location recording and its real-time flow as a cantus firmus. Over this cantus firmus, or baseline song, come soloistic voices of helicopters, jets, traffic, busses, horns, train wheels, footsteps of commuters, sirens: the found “Voices” of a fossil fueled culture organized as music. O+A have constructed this playable digital orchestra of extraordinary sonic voices extracted from cities around the world. Against and sometimes with this “Orchestra of Cities” are human voices of the singers and the text of the Requiem Mass. hour at a safe distance. “Soloists”, i.e. truck horns, car doors, etc, make antiphonal answers. (Recorded for Next Big Thing, WNYC radio, 2003. Cantus Firmus: long time flow stereo “Tuning Tube” recording of Amsterdam Avenue at 110th Street, an area of small shops and delicatessens, at 9:00 on a sunny morning in October, 2003. Against this real-time flow are balanced loops and cannons enhancing the overtone series of the original. Cantus Firmus: long time flow stereo recording of Grand Central Station at rush hour. presenting an ominous divertimento in cannons, fugues, and repetitions. Cantus Firmus: “Blue Moon”, a Tuning installation by O+A at the World Financial Center”, May-August, 2004. This location, facing New York Harbor with its huge glass and steel courtyard, fragments and amplifies passing aircraft. Three tubes in the key of C, G, and D transform this chaos, along with the sounds of waves, water, and air. Cantus Firmus: recordings of helicopter landing pad in lower Manhattan. Cantus Firmus: recordings made by “miking-up” a car as a phonograph needle and scratching the surfaces of New York City’s crumbling bridges and roadways. Cantus Firmus: “Box 3070”, sound installation by O+A, Rotterdam, 2001. A 4.5 meter tuning tube transforms the sonic environment by Erasmus Bridge and the Rotterdam Harbor. Countrapuntal answers come from recordings of the same piece in Alexanderplatz, Berlin. The tuning of the tube harmonizes the city’s signal tones into a musical environment. Cantus Firmus: recordings of the Voest Steel Plant in Linz Austria, created for Peter Sellars’s “The Persians”. Sounds of a turboprop aircraft (Flugstunde,1994) are eventually buried by the sounds of making steel.